Background: Stroke and myocardial infarction have been reported to occur after the development of herpes zoster (shingles), a common and preventable disease. Purpose: To evaluate literature describing the association between herpes zoster and its subtypes with the occurrence of cardiovascular events. 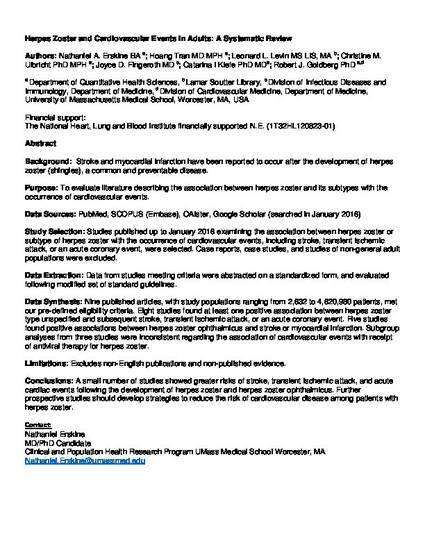 Study Selection: Studies published up to January 2016 examining the association between herpes zoster or subtype of herpes zoster with the occurrence of cardiovascular events, including stroke, transient ischemic attack, or an acute coronary event, were selected. Case reports, case studies, and studies of non-general adult populations were excluded. Data Extraction: Data from studies meeting criteria were abstracted on a standardized form, and evaluated following modified set of standard guidelines. Data Synthesis: Nine published articles, with study populations ranging from 2,632 to 4,620,980 patients, met our pre-defined eligibility criteria. Eight studies found at least one positive association between herpes zoster type unspecified and subsequent stroke, transient ischemic attack, or an acute coronary event. Five studies found positive associations between herpes zoster ophthalmicus and stroke or myocardial infarction. Subgroup analyses from three studies were inconsistent regarding the association of cardiovascular events with receipt of antiviral therapy for herpes zoster. Limitations: Excludes non-English publications and non-published evidence. Conclusions: A small number of studies showed greater risks of stroke, transient ischemic attack, and acute cardiac events following the development of herpes zoster and herpes zoster ophthalmicus. Further prospective studies should develop strategies to reduce the risk of cardiovascular disease among patients with herpes zoster.